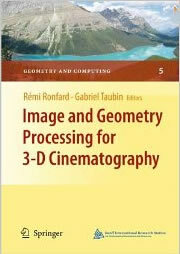 The book presents an overview of 3-D cinematography, the science and technology of generating 3-D models of dynamic scenes from multiple cameras at video frame rates. The book covers recent developments in computer vision and computer graphics that have made 3-D cinematography possible, and reviews the challenges and open issues that need to be addressed in future work. Important applications areas are presented, including production of stereoscopic movies, full 3-D animation from multiple videos, special effects for more traditional movies, and broadcasting of multiple-viewpoint television. The book brings together researchers and practitioners from computer graphics, computer vision, broadcasting and motion pictures, to offer a broad perspective on all current areas of research related to the production of high quality 3-D models of live-action scenes.